The Ocean Beach Pizza Port wins silver medal for its Skidmark Brown. Some things in life are a given, and right up there with death and taxes is the fact that San Diego’s talented stable of brewers will bring home the hardware at Denver’s Great American Beer Festival (GABF). 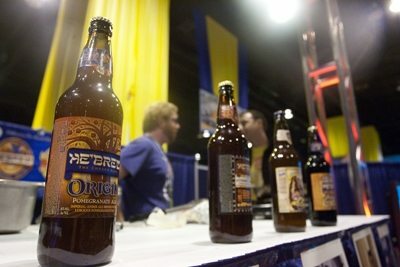 The largest annual beer competition in the U.S., the GABF is a big deal in the beer trade. To win a gold in this beery Battle Royale means the medal-winning brewery produces the very best version of a particular beer style in the country. Talk about bragging rights. San Diego is widely regarded as one of, if not the best brewing communities. It’s a solid reputation that was built on the back of many a medal win at the GABF and numerous other competitions. There’s no denying the quality of the quaffables crafted by the 40-plus operating breweries within the county. Over a dozen have earned one or several GABF medals, which makes it all the more surprising that six of the 14 total medals awarded to San Diego breweries earlier today were handed over to one operation—Pizza Port’s Carlsbad brewpub. Headed by brewer Jeff Bagby, Pizza Port Carlsbad won the most medals of any San Diego brewing company last year while bringing home the coveted Best Large Brewpub of the Year designation. Given that, there were high hopes for Bagby and company to bring it in 2010. They did not disappoint. In addition to winning for diverse brews spanning a range of flavors from dark and malty to bright and hoppy, Pizza Port Carlsbad repeated as Best Large Brewpub of the Year, which should come as no surprise to the boatloads of pie-loving patrons who perpetually pack this homegrown family-friendly parlor. But wait…there’s more. The Pizza Port family, which also includes outposts in Solana Beach, Ocean Beach and San Clemente, racked up even more honors. The Ocean Beach location, which celebrated its grand opening in April, garnered a silver medal for its Skidmark Brown. Meanwhile, the San Clemente location won gold medals for two of the most highly contested categories of all—American-Style India Pale Ale (142 entries) and Imperial India Pale Ale (97 entries)—and was named Small Brewpub of the Year. Don’t forget the Carslbad restaurant which holds both the annual Strong Ale Fest and Real Ale Fest. Also they have a bottle shop next door. All good – I had the Skidmark a few weeks back, not too bad but I still prefer the Chronic. You seem to have a lot to say about Pizza Port – do you know if there’s any difference between the OB Chronic and Carlsbad Chronic? To tell you the truth I’ve never had the Carlsbad Chronic but I love the OB Chronic. My favorite from OB tho is the Bacon and Eggs. It makes it ok to drink beer first thing in the morning. Today I met Yiga – the brewer at Pizza Port who invented the Skidmark Brown – and congratulated him. (What a name for a brew!) Also ran into Chris Dowd and he recommends their Bacon and Eggs, the beer. Thanks for all the good words. Dave, The OB Chronic started as the same recipe as the Carlsbad Chronic, however, I have been tweaking the recipe a little to make it OB centric. Frank, it was good to meet you and I hope you get a chance to try the Bacon & Eggs. Keep a look out I have a Fresh Hop IPA coming out next week, hope you guys enjoy.